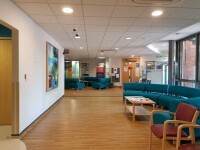 Services on the ground floor include: Minor Injury Unit, X-Ray, Day Treatment/Assessment Unit, Physiotherapy, and Outpatients. 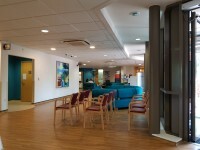 Services on the first floor include: Ward. 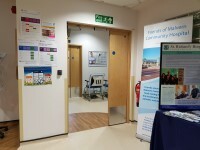 Malvern Community Hospital is located on Worcester Road and can be accessed by the A449. 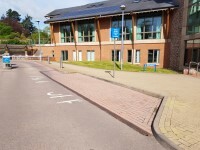 Malvern Community Hospital has its own car park for staff and visitors with 10+ Blue Badge bays. The nearest bus stop is located on Worcester Road with route 44 operating here. 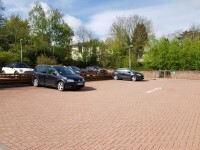 The nearest train station is Malvern Link which is approximately 0.1 miles away. The link below is for the bus provider near Malvern Community Hospital. The links below are for the train providers at Malvern Link. 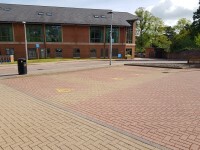 The dimensions of the designated Blue Badge parking bay(s) surveyed are 612cm x 364cm (20ft 1in x 11ft 11in). To see the parking charges please click here (opens new tab). 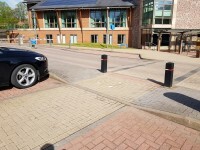 There is no tactile paving on dropped kerbs between the car park and the entrance. 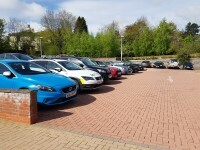 The nearest designated Blue Badge parking bay is approximately 26m (28yd 1ft) from the Main Entrance. There is a/are clearly marked onsite drop-off point(s). Drop-off is located just outside the Main Entrance. 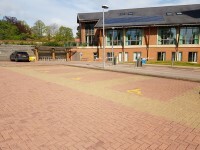 The Main Entrance is located to the right of the drop-off, To access the Main Entrance take the ramp/slope on the right. The width of the door opening is 143cm. The width of the door opening is 152cm. 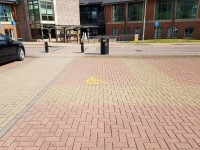 The step(s) is/are located to the left of the entrance. The reception point is located straight ahead on entering. 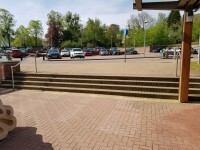 The reception point is approximately 5m (5yd 1ft) from the Main Entrance. 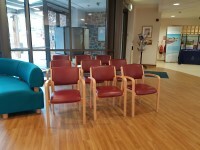 There are not windows, glazed screens or mirrors behind the reception point which could adversely affect the ability of someone to lip read. There is a clear knee recess beneath the low section of the desk. Staff are not trained to use the system. 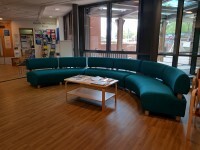 There is bench seating and single seats with armrests. The type of flooring in walkways and corridors is vinyl. 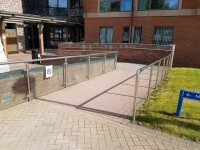 Handrails with a rounded or oval profile are not provided in corridors. Music is played in the main waiting area. 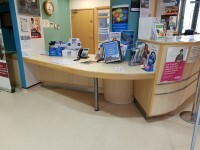 The portable loop can be found at the main hospital reception. 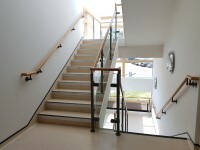 There are manual, heavy, single doors to enter and exit the stairwell on all floors. Clear signs indicating the facilities on each floor of the building are not provided on landings. 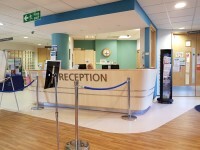 The lift is located to the left of reception. Signs indicating the location of this lift are not clearly visible from the entrance. 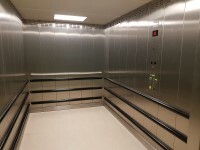 The floors which are accessible by this lift are G,1. 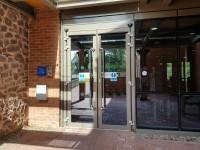 There are manual, heavy, single doors to access the lift lobby on the ground floor. 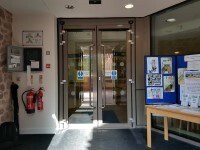 Clear signs indicating the facilities on each floor are not provided on lift lobby landings. 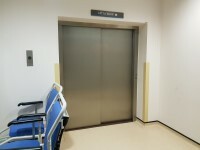 There is a clear level manoeuvring space of 150cm × 150cm in front of the lift. 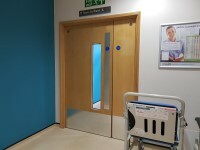 Lift doors do contrast visually with lift lobby walls. 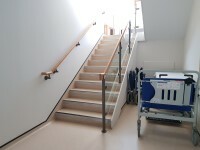 The external controls for the lift are within 90cm - 110cm from the floor. The colour contrast between the external lift controls and the control plate is good. The colour contrast between the external lift control plate and the wall is good. The dimensions of the lift are 173cm x 268cm (5ft 8in x 8ft 10in). There is not a list of floor services available within the lift. 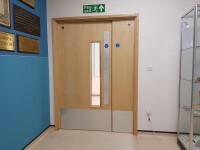 The internal controls for the lift are within 90cm - 120cm from the floor. There is a hearing loop system. The lighting level in the lift is good. 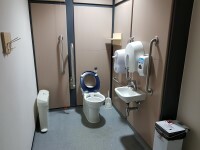 This accessible toilet is located to the right of reception. 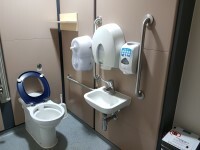 The dimensions of the accessible toilet are 167cm x 332cm (5ft 6in x 10ft 11in). The lateral transfer space is 79cm (2ft 7in). The height of the coat hook is 143cm from the floor. There is a colostomy changing shelf for standing users next to the toilet. The height of the toilet roll holder is 97cm (3ft 2in). The height of the soap dispenser is 99cm. The height of the towel dispenser is 104cm (3ft 5in). There are no standard toilets in the building.